This book is geared toward middle-grade students, roughly ages eight through thirteen. 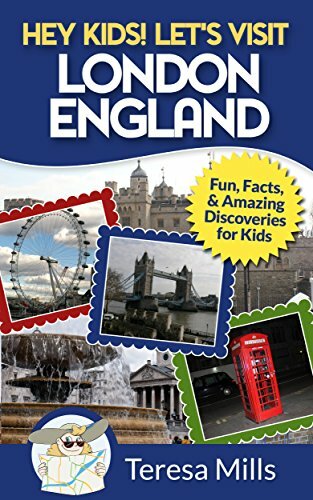 It can be used as a guidebook to prepare children who are planning a trip to London with a family or a community organization. Each site is accompanied by pictures, its history, main features, and visitor appeal. Mills talks about iconic historical landmarks like Stonehenge, The Tower of London, Big Ben, The Red Phone Booth, Westminster Abbey, and Buckingham Palace. She discusses street landmarks like Piccadilly Circus, Trafalgar Square, the London Eye, and Harrod’s Department Store. Other notable spots to visit include The London Zoo, Hampstead Heath, The Globe Theater, and Platform 9 3/4’s with its connection to Harry Potter. Of course, no visit would be complete without a ride on the London tube or a visit to one of the museums like The Duxford Air & Space Museum or the RAF Museum. There is so much to see. Mills has especially focused on those of interest to children. This book can also be useful as a starting place for a school project on London. The book need not be read in any particular order as the chapters are not laid out sequentially.